In most big cities, the closest you get to the great outdoors is taking a stroll through a public park, only to encounter local wildlife like squirrels, homeless people, and more squirrels. For some people, this is enough. For the rest of us, though, a wealth of natural resources and activities await in the vastness of America's plentiful backcountry -- boozy river tubing, for instance. California took the no. 1 spot, thanks to its unparalleled number of rock climbing locations (14,764) and campgrounds (663) -- it's no wonder Californians exercise the most in the country. New York's 1,288mi of recreation trails and 26 national parks landed it in second place, meanwhile, with Pennsylvania's 2,466 rock climbing locations nipping at its heels in third place. 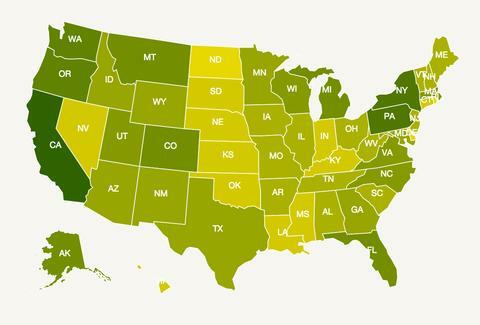 Oh, and the least outdoorsy state? That honor goes to Delaware, with only 22mi of recreation trails and no national parks at all. Yes, it's the second-smallest state after Rhode Island (which fared slightly better in 49th place), so maybe it's not a very fair comparison. North Dakota, meanwhile has no excuse: it landed in 48th place, proving once again that there's really no reason to ever go to North Dakota.